Before the film industry moved West, it was firmly rooted in Chicago. 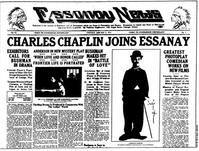 Some of its key players included Charlie Chaplin, Gloria Swanson, "Broncho Billy" Anderson, and many more. Join film historian Annette Bochenek for a presentation about the film industry's early days in Chicago, as she discusses former silent film studios in Chicago, film stars who worked in Chicago, and the legacies of these studios and stars today. The program will include a multimedia presentation consisting of photos, video clips, and captivating stories.